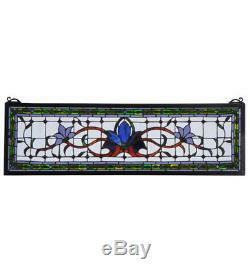 Herald in a touch of class to your home with this stylized floral stained glass window that features beautiful vivid colors in a simplistic design. At the focal point of this window is a cobalt flower flanked by violet flowers on each side. Mahogany stems and green leaves wed the floral design on a clear back ground accented with plum jewels. A green chain link design accented with blue diamonds and plum jewels is surrounded by violet to complete the design. This stunning window is created using Meyda Tiffany? S famous copper foil construction process and attached to a Black frame. This transom window can be used above a door or placed as a pair on both sides of a door, especially in entryways. Brackets and hanging chains are included. Total Weight: 5.5 lbs. Product must be in new condition and in the original, unopened packaging. We are a small family owned business focused on our customers. Customer service is our top priority! 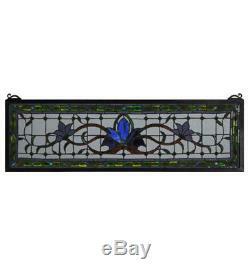 The item "Fairy Tale Transom Stained Glass Window Panel Tiffany Style 33W X 10H 119445" is in sale since Sunday, January 28, 2018. This item is in the category "Antiques\Architectural & Garden\Stained Glass Windows". The seller is "lovingmydecor" and is located in Yorkville, New York. This item can be shipped to United States.